It’s quite possible these days for teens and young adults to not know a time in their lives without the Internet. Our lives can be tracked online; this is the driving force behind Featherweight, written and directed by Tom McGee, playing at the Paddock Tavern as part of the 2018 Toronto Fringe Festival. A cross between American Gods and Twelve Angry Men where a man is judged by his browser history upon death. Featherweight is an intense high energy immersive show that keeps the audience transfixed throughout. The jokes are fun and great for laughs but when this production gets into the nitty gritty, it gets in there hard. Jeff (Michael Musi) has died and before he can reach his final destination, his soul must be judged. Thoth (Kat Letwin) is present to moderate his judgment and channel individuals from Jeff’s past. Anubis (Amanda Cordner) is judge, jury, and sentencer, weighing Jeff’s heart against a feather and using his browser history to determine whether Jeff was a good human or not. From the start, I could tell these three would deliver a show that would be well worth the watch. Their chemistry is strong as are their individual performances. Letwin stands out the most — her physical performance as the frantic and almost mousy Thoth is endearing, and when she channels first Sarah, a woman whose leaked striptease video made its way into Jeff’s Tumblr search, and then Jeff’s deadbeat dad, it is dynamic and penetrating. There’s far more going on beneath the surface of this show that is intriguing and begs further thought and deep diving — what small and seemingly insignificant thing did I do when inebriated or younger and not thinking clearly has made its way online? How does this small thing impact other people? This gets broken down and inspected with a microscope when judging Jeff. There’s a deeper underlying story between Anubis and Thoth regarding if the Gods would pass their own test. The moments that touched on this were enough to lead me into wanting just that much more back story but then the moments would shift back to Jeff. I, personally, would love to see more of that story but understand it would distract from Jeff’s judgment. 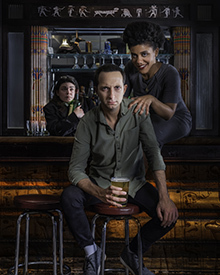 Featherweight is going to be one of those not-to-miss Fringe Festival gems this year. It will keep you wrapped up and leave you slightly troubled and wanting more. This is definitely worth checking out. Content Warnings: Mature language; Sexual content; No minors admitted; Unconventional venue. Got a lucky wait-list ticket to this tonight and it was SO GOOD. Seconding Samantha, Featherweight is a gem.